In 1901-1903 popular and spectacular Kiev architect Vladislav Gorodezhkii put up a private house that is known as a House with Chimeras. Inside and outside the building is decorated with quaint and sometimes even freakish sculptures, including maidens on fantastic fishes, elephants, rhinoceroses, antelopes, frogs, lizards, eagles, snakes and even a little crocodile. The sculptures are made of cement, and there is a legend saying that architect Gorodezhkii together with companies producing cement intended to construct a house that would be kind of advertisement for new building material. Modern historians consider this legend to be close to reality, because Gorodezhkii was one of the owners of cement producing plants. So orders for the materials that followed after the House with Chimeras construction would be very profitable for him. Gorodezhkii built the House with Chimeras for his family. He was very ambitious architect and did not want any other building to stand next to his house, so he decided to purchase two plots of land. One plot was intended for the house and another one was empty, but still the architect reached his goal, as nobody could buy that land and put up a building there. Nowadays this plot of land is occupied by stairs leading to Ivan Franko Theater. Immediately after the construction works of the House with Chimeras were completed, it became surrounded with numerous legends. One of them says that the architect planned to construct the house after the death of his daughter who drowned in Dnepr or committed suicide because of unrequited love. According to this legend, the architect went crazy and decided to decorate the house with Dnepr inhabitants, such as fishes and weird maidens, who, as he thought, surrounded his daughter after her tragic death. Another legend is not so ominous. It explains a very unprofitable location of the House with Chimeras from strategical point of view. The thing is that the house is situated on steep slope of Pecherskie Hills, which made the building construction a real challenge. Gorodezhkii, who was famous for his adventurism, betted with his friends architects that he would complete such a difficult task. He really managed to put up the House on the edge of dangerous precipice and won the bet. However, modern architects confirm that the House with Chimeras is in poor condition today, as its facade is covered with cracks, and according to the results of specialists' investigation works, the whole building sinks down the slope. 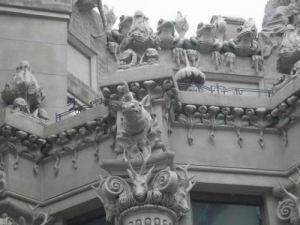 Still once there was an idea to make the House with Chimeras the new residence of Ukrainian President. His present residence is located in front of the Gorodezhkii's house. The question of the residence transformation is still being discussed, but it is obvious that the House with Chimeras needs a thorough repair. There is one more legend about the house. It says that Gorodezhkii, who was a talented architect and passionate hunter, also was a sorcerer. Some people believe that he put a paternoster on his house, so that only his descendants could happily live in the House with Chimeras. According to the legend, the house will bring misfortune to any stranger who would try to live in it.